Deodorants, Antiperspirants, & Breast Cancer? With breast cancer on the rise and it being diagnosed earlier in women now than in previous years, one has got to wonder if deodorants and antiperspirants are to blame, amongst poor eating habits, stress, oral contraceptive use, and family history, of course. You might be wondering what the difference between the two are so here it is: Deodorants work to mask any unpleasant underarm odour due to sweating whereas antiperspirants are used to temporarily block the sweat glands from bringing sweat to the surface of the skin. There are many articles out there that suggest that certain chemical substances found in deodorants and antiperspirants are harmful and can be absorbed through the skin, especially if you shave your underarms. Although there have been some studies that support this, the fact remains that more thorough research is needed. Researchers at the National Cancer Institute claim that even they are unaware of any conclusive evidence which links deodorant and antiperspirant use to the development of cancerous breast tumours. However, just because there isn’t enough evidence today, it doesn’t necessarily mean that we should neglect what scientists have found thus far. Have you looked at the ingredient list on your deodorant or antiperspirant? An aluminum-based compound (aluminum chloride, aluminum chlorohydrate, aluminum zirconium chlorohydrate, and aluminum sulfate) is the active ingredients in most antiperspirants and they work by plugging the apocrine sweat glands found in the underarms. Any chemcial that blocks your sweat glands, even temporarily is probably not a good thing. Our body is designed with sweat glands not only to regulate temperature but to get rid of bodily wastes and toxins. Aluminum compounds are known to cause alterations in DNA. Furthermore, there have been research that suggests that aluminum compounds can be absorbed by the body and cause estrogen-like effects. Estrogen, a female hormone, in excess is known to trigger tumor growth and because of this researchers claim that the aluminum compounds found in many antiperspirants can infact cause breast cancer or at the very least contribute to tumors in the breast. If you wear antiperspirant, this is a good time to check whether your antiperspirant has an aluminum-based compound in it. While looking out for aluminum compounds, it is also beneficial to look for a paraben-free antiperspirant or deodorant. Paraben will be listed as methylparaben, propylparaben, butylparaben, or benzylparaben. Paraben is simply used as a preservative in deodorants and antiperspirants as well as in other personal care items and cosmetics. Paraben like aluminum compounds is known to mimic estrogen. A study published in 2004, reported that paraben was found intact in the cells of the 18 out of 20 samples of human breast tumors that were studied. Unfortunately this study did not identify the source of the parabens and therefore more research is needed. If you do your own research you will see that there are many articles claiming that there is no direct or clear link to show that the use of deodorant and antiperspirant with aluminum and parabens may play a role in the development of cancers of the breast. This is currently true only because of the lack of studies. In a few more years scientists may very well have sufficient research. Until then it is best to err on the side of caution, especially if you have breast cancer in your family history. According to the Breast Cancer Society of Canada, breast cancer is the most common type of cancer among Canadian women as 1 out of every 9 women is expected to develop breast cancer sometime in her lifetime. 1 out of 29 women diagnosed with breast cancer is expected to die. 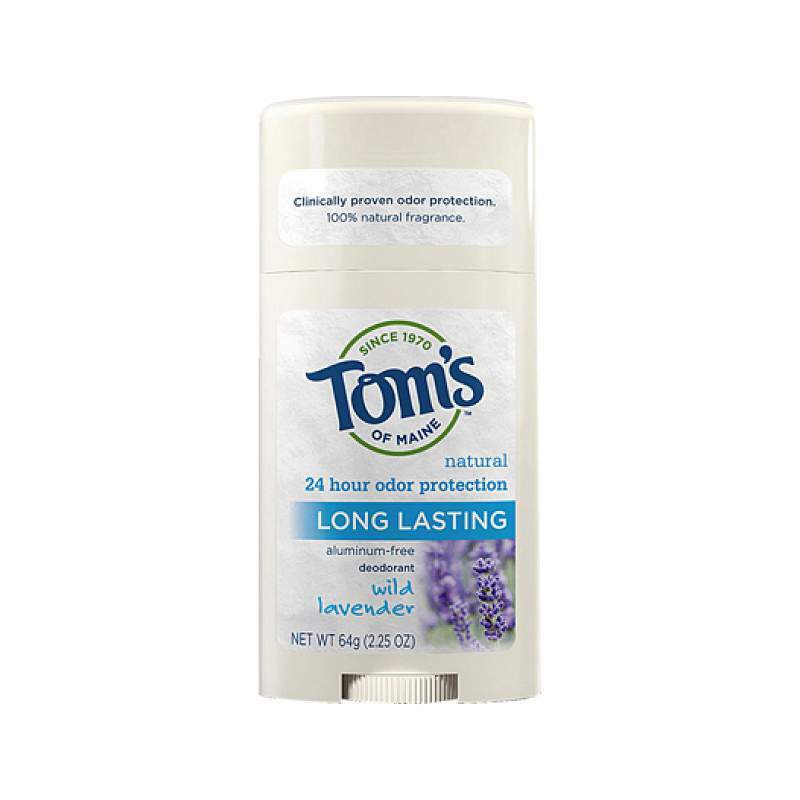 If you have concerns regarding the deodorant or antiperspirant you are using, consider switching to a more natural one such as Toms of Maine Long Lasting Natural Deodorant which can be found at the Real Canadian Superstore, Whole Foods Market and other health food stores. Toms of Maine uses a formula that is aluminum-free and instead and uses the mineral zinc and natural fragrances such as lavender to provide odour protection. Click here to read more. 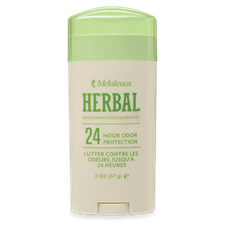 Another great deodorant out there is Melaleuca Herbal Deodorant which combines zinc rincinolate, Zea Mays Starch and baking soda to absorb unpleasant odours as well as aloe, Vitamin E, and tea tree oil and other plant-derived substances to nourish the underarm skin. If you are interested in learning more about this product, please contact me.